Liu, Na. 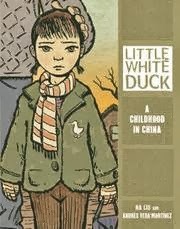 Little White Duck: a Childhood in China. Graphic Universe, 2012. This GN details the lives of two girls growing up in 1970s China, so it is a great peek into both another time period and another culture. The illustrations make the story much more engaging and inviting, and the fact that this is a graphic novel is probably the reason many of my students check it out in the first place. "Mrs. F, where are the scary books?" "Miss Libarry Teacher, where's the Percy Jackson books?" "I read all the Diary of a Wimpy Kid books; what should I read next?" "Where are the love stories?" For the first two months of school, I fielded these types of questions all day long. For the kids looking for a specific title, I was able to point them in the right direction. But when a kid wants a genre of book or a book similar to his/her favorite series, I had more difficulty. It wasn't hard to come up with a read-alike, but it was hard to point the student to the shelf containing all the read-alikes. Thus I decided that the fiction section in my middle school library needed to be divided by genre. I started by reading everything Mrs. Readerpants had to say on the subject. And I paid close attention to both my collection and my students. After I finished planning, it was time to roll up my sleeves and get to work. Then I took the books to my desk, one cart-full at a time. Each book had to be individually scanned, changed in the computer, and tagged with a color-coding sticker on the spine. I changed the call numbers to reflect the new genres; for example, Harry Potter and the Sorcerer's Stone was changed from F ROW to F FAN ROWLING. Keeping the fiction designation allows all the fiction to still be grouped together in my catalog, but the genre classification allows my patrons to find the books in the correct location. This was a long process, and I have a small library, so I can imagine it would be a much bigger task in a larger library. Most of the books were easy to genre-fy. Some books I had to look up on Goodreads to see other people's categories and get an idea of where they should go. 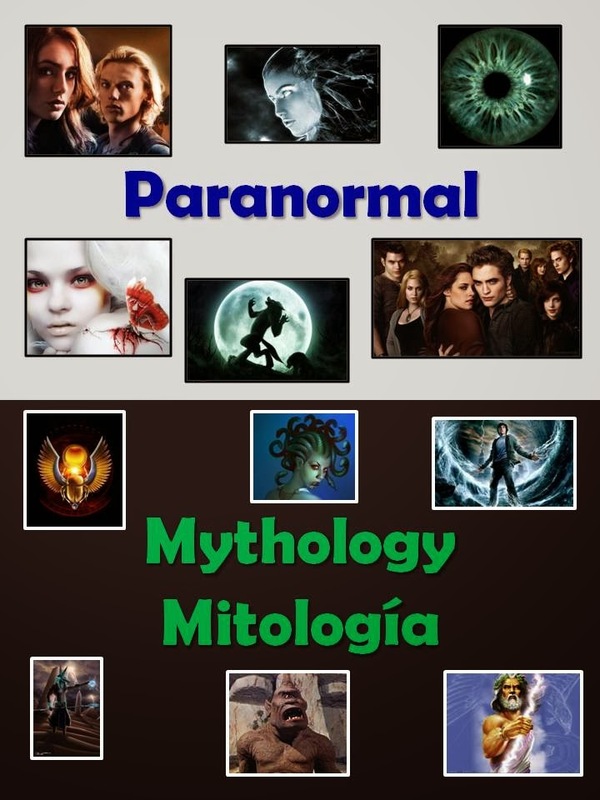 If a book fit in multiple genres, I put it where I thought my students would be most likely to look for it. As I completed each cart, I adjusted the shelves so that the genres were placed together. This meant I shifted books a lot, but it was good for me to be able to see how the genres would all fit on my shelves. I have wooden bookshelves and they are attached to my walls, so I couldn't rearrange the shelving itself, but I was able to dedicate a certain number of shelves to each genre. I ended up giving each genre its own vertical bookshelf, except that Mystery shares with Scary books and Mythology and Paranormal share a shelf. This is because of my two biggest genres: historical fiction and fantasy both needed two vertical shelves each to fit all the books. I am now considering dividing both of those sections into subsections. 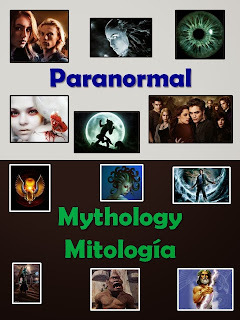 I would split fantasy into high/low fantasy (because kids who like Harry Potter will not necessarily gravitate toward Redwall), and I am considering dividing the historical fiction by broad time periods or just pulling particular topics into their own area (World War II and the colonial period, for example, have a lot of books each). It took me approximately one week, working on my own, to genrify all of my fiction and graphic novels. I still have to genrify any books that have been checked out during this process, but that is a much smaller project that can be completed as the books are returned to the library. I have signage up in each section that identifies the genre (in English and Spanish). The signs contain pictures that represent that genre, and the lettering on each sign matches the color codes for that particular genre. Already I have noticed a difference in the way my students look for books, and many books that have not moved at all this year are now circulating. It's too soon to tell what difference this will make in my circulation statistics, but the comments from students and teachers alike make the hard work worthwhile. "Wow, the library is so much nicer this year." "I can actually find the books I like to read." "It's so much more organized; I like our library." If you are considering dividing your fiction section by genre and you have questions for me, feel free to comment on this post and I can reply to you via email. I am also willing to share the signage I created; I can send you a PDF copy of that document upon request. Angleberger, Tom. 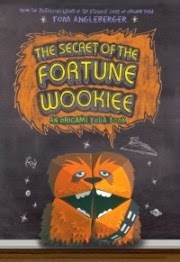 The Secret of the Fortune Wookiee. Amulet Books, 2012. Dwight has been suspended, so the kids are struggling to survive without Origami Yoda's advice. Fortunately, they are rescued by the Fortune Wookiee, who is able to help them come up with a plan to rescue Dwight from his new school and bring him back! This book is just as adorable and delightful as the previous two in the series. This series is very, very popular in my library, not only with my Star Wars fans, but also with kids who have enjoyed the Wimpy Kid series. McKinlay, Meg. Below. Candlewick, 2013. Cassie was born eight weeks premature, so her family missed the drowning of their town while they were driving to the hospital to welcome her into the world. Their town was intentionally drowned when a new dam was built, and the town moved a few miles away to higher ground. 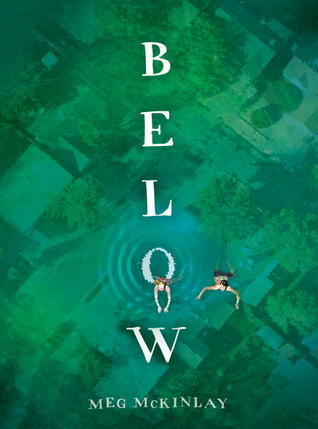 Now Cassie spends every day swimming to strengthen her lungs, but when she decides to swim in the lake that covers the old town, she finds secrets that some preferred to keep hidden. I was initially intrigued by the plot of this story, but it takes a significant amount of pages for the plot to be revealed and for the tension to build. Even though this book is short, I don't think many of my weaker readers would stay interested long enough to find out that there's a mystery involved. The book sounded like it should be intense and mysterious, but it sort of fell flat in that area. Nonetheless, I am sure some of my students will enjoy this book. Crowder, Melanie. Parched. Houghton Mifflin, 2013. Musa knows how to find water with divining rods. He is being held captive by a gang. Sarel just watched her parents get killed and her family's home burn to the ground, but she is kept alive by a secret cache of water. Nandi is the leader of Sarel's family's dog pack. The three unlikely companions meet and must work together to survive and to find the water everyone needs. First off, there are not enough books about other cultures, especially places like Africa, so I am glad that this book exists. I think it would be a great companion novel to A Long Walk to Water by Linda Sue Park. This book is written in a very poetic style and it's beautiful to read, even as it is painful to think of living that close to daily dehydration. 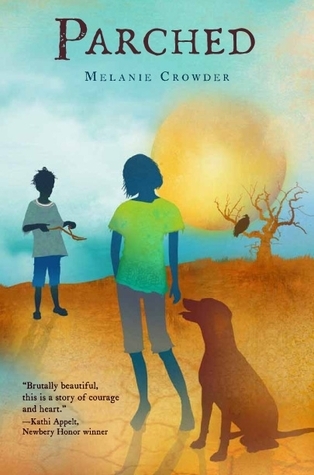 However, the first chapter is told from the perspective of the dog, and each successive chapter is told from either Musa's or Nandi's point of view, so it takes a while to get into the story. I did enjoy this one, but I think it will be a harder sell for all but my strongest readers. Ottaviani, Jim. Primates: The Fearless Science of Jane Goodall, Dian Fossey, and Birute Galdikas. First Second, 2013. As its title indicates, this is a nonfiction graphic novel focusing on the the study of primates and describing the careers of three notable female primatologists. The illustrations are engaging and the information is enlightening. 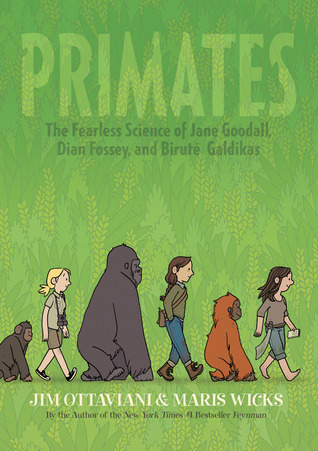 Even though I'm not very interested in primatology, I was interested in reading this particular graphic novel, and I could see this book as a good stepping stone to get students interested in other books in our nonfiction collection. Pincus, Gregory. 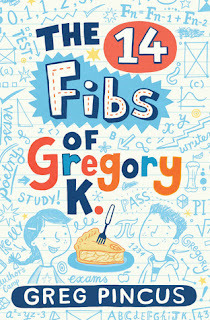 The 14 Fibs of Gregory K. Arthur A. Levine Books, 2013. Greg is surrounded by math-aholics. His father and his brother both have won the annual City Math competition, and his mother and his younger sister also enjoy math. 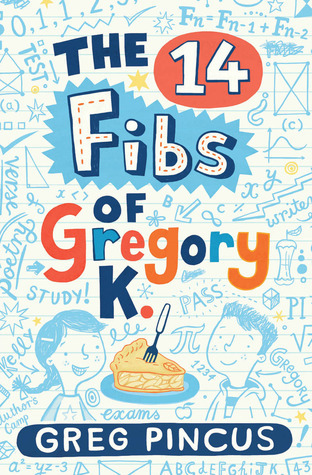 Greg has feigned enthusiasm for math his entire life when really he would rather be a writer. He has hidden notebooks filled with stories and poems. But when Greg chooses to enter the City Math competition in order to save his math grade and possibly convince his parents to let him go to Author Camp, he soon finds that he'll have to learn to combine his greatest talent with his secret weakness. This book was just adorable. The family was very believable (if weird), Greg sounded exactly like a middle school student, and the trauma of math class plus his friend moving made for a great plot. Also, I love the title of the book; it's clever enough to hook readers in, but also becomes a major part of the story's resolution. This would be a fun book for math whizzes and mathophobes alike, and it has definitely earned its place on the shelves of my middle school library. Eddleman, Peggy. Sky Jumpers. Random House, 2013. After the green bombs of World War III killed most of earth's population and rendered many places uninhabitable due to the "bomb's breath," a gas that settled in the air and kills instantly, settlements of survivors have sprung up. Hope and her family live in White Rock, where everyone focuses on inventing new things that can help the community to recover in the wake of the war. But when a group of bandits attack in the middle of winter and threaten to take the settlement's supply of medicine, it is up to Hope to sneak out and bring help. Will Hope be able to save her family and community? 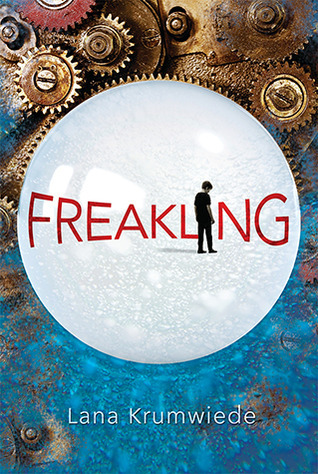 This book is a much more upbeat take on the typical dystopian novel. Even though the world has changed and most of the population has died, the focus is on the community that has been rebuilt and the progress they have made in spite of their lack of resources. Hope isn't a perfect character, but she is one worth applauding, and I enjoyed following her and her gang of friends as they tried to save their community from the bandits. 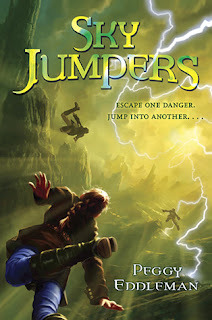 I think this one would be popular in my library, and the short length combined with the action would guarantee that I could convince reluctant readers to give it a try, too. Moynihan, Lindsay. 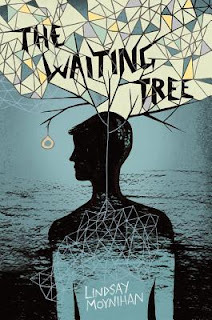 The Waiting Tree. Amazon Children's, 2013. Simon has a twin brother who is mute, two older brothers, one of whom is ridiculously self-centered, and no parents. His oldest brother is in charge until the boys are all old enough to move out on their own, but Simon feels trapped because he can't leave his twin, Jude, to struggle alone. Also, Simon had a brief relationship with Stephen, but Stephen's parents have shipped him off to a Christian "counseling" center to cure him of being gay. And one of Simon's older brothers is selling drugs. This book had a lot going on, to the point where I wondered what Simon had ever done to the author to deserve all of this. No one in this book goes to school. No social services people ever come by to check on Jude or Simon, both of whom are minors. Stephen, who is no longer a minor, is choosing to stay at the center, because he knew his parents would hate his guts if he came home. So when Simon's brother gets caught dealing drugs, Jude confesses and turns himself in, knowing that this will allow Simon to escape this crazy life he's dealing with. I spent most of this book wanting to scream at all the characters and wondering where the real adults were. This one is not worth your time, folks. Fisher, Catherine. 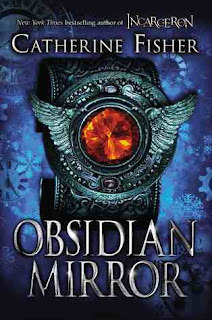 The Obsidian Mirror. Dial, 2013. Jake has finally gotten himself kicked out of boarding school, and he's being sent back to stay with the man he thinks murdered his father. Jake is glad for the chance to find the truth and also seek revenge, but he gets more than he bargained for when he encounters Oberon Venn and his mirror. Venn had been working with Jake's father to use the mirror for time travel. Will Jake be able to bring his father back from the past and destroy the dangerous mirror once and for all? This book was really intense and interesting after a rather strange start. 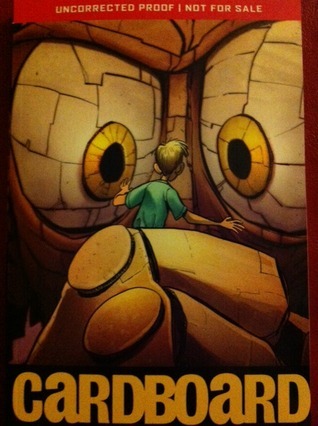 The book opens with Jake getting kicked out of school, but that isn't really the focus of the story. The story of this mirror that allows people to time travel, and of the devastation that has caused in multiple time periods, was really interesting. I was intrigued to see how the book would end, and this book has already circulated several times in just the first couple weeks of school, so it's popular with my students, too. Columbus, Chris. 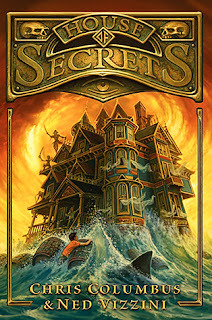 House of Secrets. Balzer + Bray, 2013. The kids in the Walker family had a great life, that is, until their father lost his job. Now they are downsizing, and they move into a mysterious house in the Sea Cliff area of San Francisco. But the trio soon find that the house holds more than its share of secrets. Will the kids be able to save themselves and their parents before it's too late? Phelan, Matt. 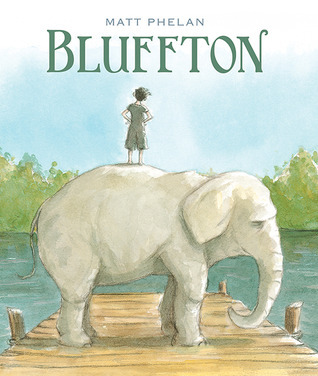 Bluffton: My Summers with Buster Keaton. Candlewick, 2013. Vaudeville performers invade small town Michigan in the early 1900s, and a small boy spends several successive summers with the group, befriending Buster "the human mop" and getting to know the performers. Not much else happens in this story, which has a gentle pace that matches its pastel illustrations. I didn't like this book as much as I've liked others. The slow pace and nostalgic feel didn't appeal to me, and I don't think it will appeal to my teen readers, but my wife loved the book, so I think I was just the wrong audience for it. I will still book talk it to my patrons and see who will be interested. TenNapel, Doug. Cardboard. GRAPHIX, 2012. Cam's father has no money, so although Cam is disappointed when he receives an empty cardboard box for his birthday, he determines to make the best of it. Imagine his surprise when the boxer they created from the cardboard box comes to life! But Cam's rival Marcus is determined to make his own cardboard creation, and what started as a gift soon becomes a disaster larger than either Cam or Marcus. I enjoyed the illustrations in this story. I enjoyed the plot. I think this book will be very popular with my patrons. However, when Marcus has his "great turnaround" at the end of the book, I'm a bit disturbed that the only noticeable change is that he gets a haircut. Short hair does not a person reform. That and his friend Pink Eye's disgusting pink eyes are my only objections. Overall, though, this is a great book. Krumwiede, Lana. Freakling. Candlewick, 2012. Everyone in Taemon's world has a special power called Psi - the ability to move objects with one's mind. They are eagerly awaiting the arrival of The Chosen One, while rival factions disagree about the use of Psi and the application of this power. When Taemon loses his Psi ability in an accident, he is terrified that he will be discovered and sent away to live with other Psi-less individuals. All the while his brother has been accepted as The Chosen One and is gaining more and more power. Can Taemon keep his disability a secret, and what is his role in his brother's imminent reign? This book was much better than I expected it to be. Taemon's time in the world of the Psi-less reminded me of Swans & Klons. I was happy to watch Taemon change and grow, his competition with his brother seemed very realistic to me, and I enjoyed the ending of the story very much. This one will be popular with my science fiction fans, especially those who enjoy reading about the Force in Star Wars.